Learn from successful people from many different walks of life. What did they do and say to win that job or get promoted? How did they negotiate? What is their secret? Prepare for job interviews with authentic scripts for various occupations, find the right recruiter or headhunter, get references that work, ask the right questions, negotiate the salary you deserve, pass your performance review with flying colors, advance your career... and more. Throughout her career, Natasha Cooper has been wearing several hats. For over 25 years she has taught English as a Second Language and business communication skills to speakers of other languages. Her columns on communication skills regularly appear in a number of periodicals around the U.S. She is also a conference interpreter with an impressive list of clients, such as U.S. Department of State, United Nations; Presidents Gorbachev and Reagan. 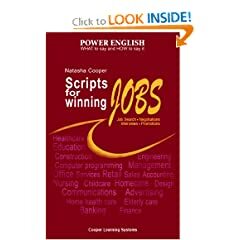 Ms. Cooper is the author of the POWER ENGLISH series which includes "The Telephone in Business and Daily Life", "Appointments and Reservations", "Obtaining Information, Goods and Services" and "Resolving Problems and Emergencies".